The Old Castlemaine Gaol could not be a more perfect venue for Chants des Catacombes, a gripping story about three forgotten murder victims — a showgirl, a courtesan and a surgeon. In this macabre musical theatre performance, the innocence of each woman has been stripped away, leaving them as entombed creatures from a strange time. History has turned the page yet these women continue to restlessly walk up and down the dark corridors of the catacombs, intermittently remembering and forgetting. Poignant and eerie, Chants des Catacombes is an immersive and multi-sensory, promenade theatre experience. The audience is led through the gaol by an unfolding narrative. Lyrics are like bent fairytales, whispered, commanded, serenaded, shouted. Contemporary songs by artists such as Portishead, Nirvana and Laura Marling are adapted and given enchanting or horrific twists, transformed into the unique and the timeless. Brought to us by Present Tense Collective, the historic Old Castlemaine Gaol will once again breathe and heave to a strangely familiar theme. 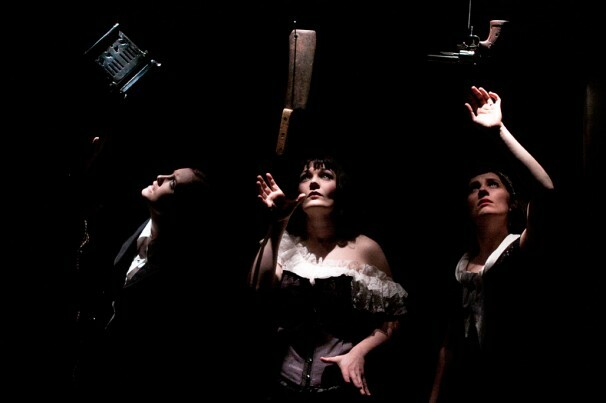 Chants des Catacombescomes to Castlemaine in 2013 after winning the 2010 Short+Sweet Cabaret Festival and sell-out seasons in Melbourne, and at the 2012 Adelaide Fringe. Pre-show wine, beer, soft drinks and snacks.